When you want to call attention to an issue, you normally assign a day to it. Yesterday was Net Neutrality Day in America, when the tech world -- or most of it -- tried to mobilize public support against rolling back the previous administration's internet policy. The problem with these issue days is there seems to be one every other week. Often the public's collective eyes glaze over. But the message from big internet users like Netflix, Reddit, and GoDaddy was this: a free and open internet, established by Federal Communications Commission (FCC) policy under the Obama Administration, is in danger of being reversed under the Trump Administration. 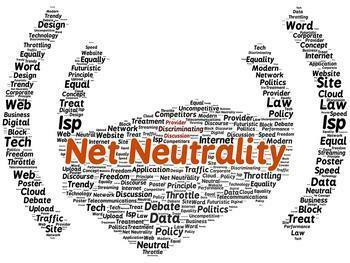 Net Neutrality is the principle that internet service providers (ISP) cannot favor one company's content over another. For example, it can't allocate faster speeds to an internet company if it pays an extra fee, giving that company an advantage over a competitor who doesn't pay the fee. The large ISPs, like Verizon, AT&T, and Comcast, have always maintained that they own their networks and have taken issue with the current policy that treats them like utilities. According to Daily Variety, the organizers of Net Neutrality Day, which warned consumers the internet was about to get a lot slower and urged them to protest to the FCC and lawmakers, are optimistic. At the very least, they say the FCC will have to respond to all the protests. Net Neutrality broke into the public consciousness -- sort of -- three years ago when comedian John Oliver did a whole segment on it during his HBO show, a segment that went viral. Take a look, but be warned, it's a premium cable show that doesn't bleep out expletives. Within a year of that broadcast, the FCC adopted its Net Neutrality policy. Tech companies are hoping their one-day blitz can have a similar effect, and save it.